Bishop Malooly celebrated the Diocese of Wilmington’s Sesquicentennial Kick-off Mass on Saturday, March 3, 2018 at the Cathedral of Saint Peter, Sixth and West Streets in Wilmington. Catholics from across Delaware and Maryland’s Eastern Shore gathered Gather to pray and give thanks. Diocese of Wilmington was founded by Blessed Pope Pius IX on March 3, 1868. 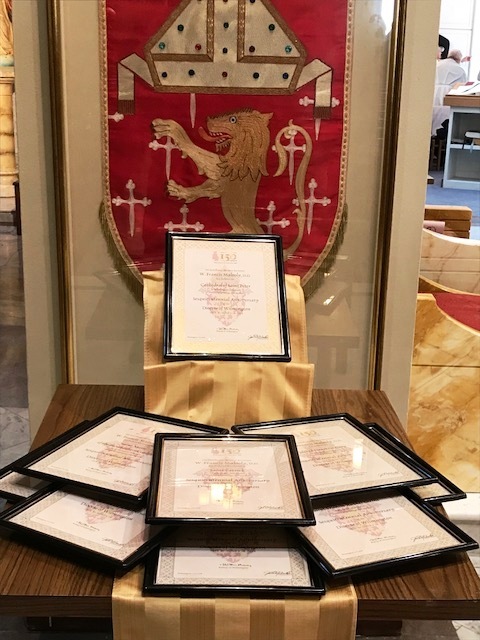 At the end of Mass, Bishop Malooly blessed certificates designating nine churches in Delaware and Maryland’s Eastern Shore as Official Sesquicentennial Pilgrimage Churches. Those churches are Saint Francis Xavier Shrine, “Old Bohemia”, Warwick, Maryland (1704); Saint Joseph Mission, Cordova, Maryland (1765); Saint Peter the Apostle, Queenstown, Maryland (1765); Saint Mary Star of the Sea, Golden Hill, Maryland (1767); Cathedral of Saint Peter, Wilmington, Delaware (1816); Saint Patrick, Pilottown, Maryland (1819); Saint Joseph on the Brandywine, Greenville, Delaware (1841); Saint Mary of the Immaculate Conception, Wilmington, Delaware (1858); and Sacred Heart Oratory, Wilmington, Delaware (1874). These historic churches will be open for additional touring and worship on the first Saturdays of the month during the 150th anniversary year. Additionally, a gathering of Catholics from across the diocese has been announced for November 3, 2018 at the Ocean City Convention Center in Ocean City, Maryland. The gathering, titled “Convocation 150,” will include a keynote presentation, breakout sessions, roundtable discussions, prayer, and Mass. The gathering will be an opportunity to celebrate, affirm, and deepen the Catholic community’s commitment to discipleship rooted in the Gospel of Jesus Christ. Other activities during the 150th anniversary year include, a pilgrimage to Annecy, France and Rome, Italy; a prayer service to honor the Religious Men and Women of the Diocese; Masses in honor of Saints John Neumann and Francis de Sales; an ecumenical prayer service for Christian unity; and a closing Mass scheduled for March 3, 2019. Throughout the 12-month period, regional celebrations will be held. A traveling exhibition, featuring artifacts and historic documents is being planned. A coffee-table style keepsake book featuring diocesan and parish history and photographs, as well as a graphic history book of the diocese, will be published in the spring. A commemorative keep-sake rosary has been commissioned and should be available around Easter.